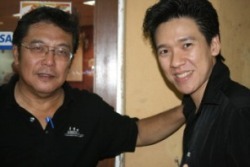 It is very seldom that two local Elvis Presley impersonators would turn up for a small dinner concert, but last Saturday's show at Desa Aman Puri, Kepong saw Malaysia's best Elvis Presley, H T Long introducing his mentee, Alex Wong. Throughout the whole evening, over a six-course dinner, Wong belted songs from Elvis Presley's own repertoire, with Long watching and commending him for the entertaining performance. "I fell ill and lost my voice last night, but I don't want to disappoint you, because you have travelled from as far as Puchong and Cheras to my concert," apologized Long profusely to a crowd of 120 at Soon Heong Teow Chew Seafood Restaurant. Long's association with Elvis Presley went back to as early as nine years old, and he was a special guest at Memphis with Elvis Presley's legendary manager Colonel Tom Parker in1984, the hometown of the late Elvis who died August 16, 1977. While Long, 58, had started impersonating the King of Rock and Roll after watching his movie GI Blues in 1960, Wong, 36, only won the Light & Easy FM's Search for Elvis in 2002. He was also picked as the best dressed Elvis Impersonator at an "Elvis to the Max Concert" in 2006. During the dinner function organised by Full Gospel Businessmen's Fellowship of Desa Aman Puri and Taman Tun Dr. Ismail, a radio recording featuring Long's songs and interview by well-known Hong Kong radio deejay, Ray Cordeiro was played to entertain the guests. According to Cordeiro, Long's singing voice matches that of the original King of Rock and Roll from Memphis, USA. It makes him stand out as being the best in Asia. He has also been referred to as the "Golden Voice of Elvis" by Worldwide Elvis Corporation USA. Walter Pacheco, president of the Official Elvis Presley Fan Club of Canada describes Long favourably: "His singing voice is so versatile that he can handle Elvis Presley songs from all three Elvis eras - the 50s, 60s, and 70s - with ease. And he does an excellent job of it. Not many can do that." Long's sense of humour also sent the audience in stitches. As he stood up on a stool, he started singing away; but just as the audience was warming up, the song came to an abrupt stop. His lips were still moving but without a sound! The audience applauded, as he apologised: "Well, ladies and gentlemen, see I told you I have lost my voice, but what you just heard is my own recording. You can buy my CDs and take me home tonight!" Long has 14 albums to his credit. Long is one local artiste who has mesmerised audiences in a number of countries, including Japan, Hong Kong, Thailand, Singapore, Indonesia, Britain, the United States and of late, he is planning another tour of Australia in November, where he will entertain thousands of Australian fans in a few major cities. A self-acclaimed atheist before becoming a born again Christian in 1989, Long said it was the death of Elvis that caused him to turn to God. "In my younger days, I would sing in pubs. I had no time for God," he said. "But, when Elvis, whom I had always thought was the greatest - a demi-god of some kind -died, I was forced to ask the question: How can my god, Elvis Presley die?" Since, he said his life has never been the same. Referring to Jesus, Long said he was inspired to compose one of his favourite gospel songs, "He Is My Everything" to the tune of Elvis's rock and roll. Thousands of people have since heard this song he composed and compiled into one of his albums. In Hong Kong, people pay $1800 just to watch him perform. "But, here in Aman Puri, you only pay RM20 for good food and good performance too," he enthused. If the King of Rock 'n' Roll, Elvis Presley was still alive today, he would probably give HT Long a pat on the back, saying to him "Well done buddy!" in his strong Memphis accent. HT Long is an Elvis Tribute Artiste well-known both locally and internationally for having a voice that sounds incredibly similar to that of the real Elvis. He was in Kuching to perform in front of avid Elvis fans at the 'Malaysian Elvis - Recording Artist Concert', organised by SIB New Life at The Sarawak Club. HT Long and many other Elvis impersonators have never crossed my mind. Yes, I do enjoy Elvis songs but I was never really keen in watching performances by his impersonators. Perhaps I'm not too much of an Elvis fan to appreciate his impersonators - even if I'm told that they sound just like the real Elvis. Also, it's probably because I grew in a different era. However, after listening to HT Long's performance for the first time at the concert, I was completely blown away. I agree with HT Long, Malaysia's best Elvis impersonator, when he says he doesn't resemble the King of Rock 'n' Roll physically. But I must say, I'm very impressed with his voice. Listening to him sing was like listening to Elvis himself. During the hour-long performance, HT Long told the audience how Elvis came into his life and how he became a Christian man he is now. In between his repertoire of Elvis tunes such as "Love Me Tender" and "Jailhouse Rock', he explained to the audience what Elvis meant to him. "The first time Elvis came into my life was after I saw his movie 'G I Blues' with my father in the cinema in 1960. I was only nine-years-old then, " he said. He recalled the time when he impersonated Elvis, singing into a badminton racquet instead of a microphone. "My look was highly influenced by Elvis. I started to grow sideburns and had 'curry puff' hair style," he said, adding that he was once nicknamed 'Klang High School Elvis.'. In 1967, still a teenager, HT Long became the founding President of the Official Elvis Presley Fan Club of Malaysia. He was proud to say that the club was the first in Malaysia to be registered and recognized by Graceland Elvis Presley Enterprise of Memphis, USA. Idolising the King of Rock 'n' Roll has really done a great deal for HT Long, who leads a colourful life. He also told the audience how he embraced Christianity. "I became a Christian after I met Reinhard Bonke, who was having a gospel rally at Stadium Merdeka in Kuala Lumpur in 1989," he said. Long added that he had recorded 12 albums to date. His gospel songs like 'I Let My Light Shine' and 'Honey In The Rock' are composed in the tunes of Elvis songs. He also has two albums, namely "HT Long Sings The Golden Hits of Rocky Teoh' and "Light & Easy With The Golden Voice Of HT Long" dedicated to another great Elvis impersonartor, Rocky Teoh, who died in a road accident. His other hit albums are"The Very Best Of HT Long', "Songs Of Love & Inspiration', "HT Long Sings The Golden Hymns" and "The King Is Alive Easter Concert." Besides recording, HT Long also gives live performances and entertain audiences both locally and internationally. He has to date, performed in Indonesia, Australia, Japan, Hong Kong, Thailand, Singapore, England and the USA. HT Long, the great Elvis impersonator of Malaysia, proves to us that although the King of Rock 'n' Roll himself has died, his music shall live on. How many of you would get excited at the idea of getting a backstage pass to meet a celebrity? I was given the opportunity to interview the former “Elvis Presley” of Malaysia. The man was HT Long, a long-time fan and former Elvis impersonator. He had been a fan since he was nine years old when he watched Elvis for the very first time in “GI Blues”. In the 1970’s, HT Long won numerous Elvis Presley singing competitions. Having made his mark, he soon became known as the “Elvis of Malaysia” and started singing in clubs and pubs. He was then an atheist and did not believe in God. One day, when he was hospitalised, he began to realise that it was the Christian pastors who visited him and prayed for him. In 1989, the Lord Jesus Christ touched him and he was never the same again. In 1994, he had a personal encounter with God. Shortly thereafter, he gave up his video and restaurant businesses to obey the Lord’s call into full-time ministry. He began to use his God-given talent and versatile singing voice to evangelise. He has since ministered in evangelistic rallies, charity concerts and in hundreds of churches in Malaysia and various parts of the world. On the recent Easter Sunday, even though it was a rainy Sunday evening, hundreds of people, young and old, converged at DUMC when they heard that this man, the “voice of Elvis” and the mouthpiece of God was going to perform there. The performance was scheduled to start at 8.00 pm but by 7.30 pm, people had started coming in. Punctuation Productions started the concert by performing a sketch that had the crowd warming up with laughter. Then HT Long started the concert proper with his rendition of “Love Me Tender” and the crowd perked up immediately. He had a tremendous deep voice that one could easily identify with Elvis. As he started singing, it became apparent why he became known as the “Elvis of Malaysia.” Clad in a white jacket, HT Long put everyone in a casual and relaxed mood. 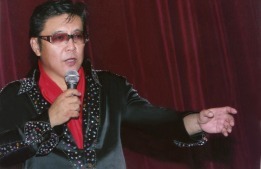 He later paid tribute to another former Elvis impersonator, Rocky Teoh, and sang some of Rocky’s trademark songs. Among them was “Jacqueline”, which was the English version of the popular Chinese song, “Ye Lai Xiang”. That really touched the crowd and before long, fans started showering him with flowers and even a teddy bear! Later he captivated the crowd with his rendition of “Crying in the Chapel”. From there, he moved into gospel songs. He shared his testimony, then moved around to shake hands and invited everyone to sing and dance with him. It was such a glorious moment as everyone present did “two steps to the left, then two steps to the right”, all the time clapping and singing to the Lord – indeed Jesus is good! As the concert came to a close, the stage was given to our Senior Pastor Daniel Ho. Pastor Daniel shared about his Graceland experience, about Elvis and his search for fulfilment. He also talked about Easter and the resurrection of our Lord Jesus Christ. By the time the evening ended, quite a number of people had already given their lives to the Lord. TOKYO - The Best Elvis impersonator from Malaysia flew into Tokyo on Friday for an extravaganza concert to mark the 25th anniversary of the King of Rock n Roll Elvis's death. 'The Man with The King's Voice' HT Long, known for his trademark white baggy blazer and blue suede shoes is a superb singer of the highest calibre. He sounds exactly like the real Elvis. You might think that's impossible because he's an Asian. But listen to him sing , and you will be shocked. HT Long will stage a three-hour "Elvis Forever in Asia" concert expected to attract 1,500 people on Saturday. The event, sponsored by Japan's 5,000-member Elvis Presley Fan Club, is the first of its kind here. "No one can replicate him. I just try to do justice to his songs," said HT Long who wore gold-rimmed sunglasses during a rendition of "All Shook Up" that was punctuated with pelvic thrusts. "When he died, my whole world crashed," said 51-year-old Long. "For a week, I just stayed in my room, looking at my posters and albums. I cried and cried." Even in Asia, where Elvis never visited, the 25th anniversary of his death Friday drew out the King's dedicated following. In central Tokyo, fans flocked to a life-sized bronze statue of Elvis strumming a guitar and lay flowers on its base in homage. Corky Kitahara, president of the Japanese club, estimates that there are 500,000 Elvis fans throughout Asia. Among them is Japan's prime minister, Junichiro Koizumi, who last year wrote to the fan club: "My birthday is Jan 8, the same as Elvis. It's one of the things I'm so proud of." Koizumi's name is engraved on the Elvis statue's donor's plaque: In 1985, when he was a member of parliament and a board member of the Elvis Fan Club, he helped raise money for the memorial. At the nearby Elvis memorabilia shop, Love Me Tender, the CD-compilation of Elvis songs picked by Koizumi was sold out. The 25-song disc, "Junichiro Koizumi Presents: My Favorite Elvis Songs," has been a hit since it was released last year, manager Yosuke Funabashi said. The $17 collection includes such hits as "I Want You, I Need You, I Love You." Proceeds go to charity. The CD's front cover shows a photo of a smiling Koizumi with his trademark wavy, long hair next to Elvis. HT Long had been an Elvis fan since 1960 when he was only 9 years old. "My mom bought me Elvis' records when I was younger. It cost her RM2.50 for a single and RM4 for an EP. When I was about 12 years old, I persuaded my mom to buy me a portable record play so I could bring it out every day." "As youngsters then, we normally looked up to somebody. I used to try to look like Elvis. His hairstyle was known as the curry puff hairstyle then. "I had long hair in school and was called up by the disciplinary master a few times. He would always pull my hair and sideburns. I was also known as the Klang High School Elvis then." "When Elvis died, I didn't eat for days," Long recounted the moments when he received news of the death of his idol. "I was 26 years old then. I did not believe it when they said he died until I read the news in the Malay Mail." After graduating from school, HT Long joined singing competitions and won many of them. He won himself the title "Malaysian Elvis Presley". He has recorded 12 albums. His albums have been getting reviews worldwide and reviewers even call him "the sound of Elvis". "I did one show in Perth. I looked like a typical Chinese fellow on the posters and the Australians thought it was just another William Hung. When they heard me sing "Love Me Tender", they were shocked. Some of the ladies even broke down and cried." Such was the striking resemblance HT Long's voice bore with Elvis'. Like many other fans, HT Long also admired Elvis for his love for his mother and acknowledged the great support that Elvis got from his mother. "If his mother is still alive, he will also still be alive." Kuching: The name HT Long might not ring a bell in many Sarawakians, but that might well change come Sept 29. Among fans of the late Elvis Presley, HT Long is seen as the reincarnation of the singing legend because he sings like the King. In fact, it is on this strength that HT Long will perform at the Sarawak Club on Sept 29 as the world remembers Elvis' 30th death anniversary. Dubbed 'One of The Very Best Elvis Presley of Malaysia' and 'Malaysia's Very Own King of Rock and Roll', HT Long will be peforming in Sarawak for the first time. A press release emailed here yesterday by the organisers quoted the president of the official Elvis Presley Fan Club of Canada, Walter Pacheco, as saying that HT Long is so versatile that he can present Elvis' songs through 50s, 60s and 70s. It also quoted Dr.Paul Dowling of Worldwide Elvis, USA - the world No.1 authority on Elvis - as having described HT Long as 'the man with the Golden Voice of Elvis'. HT Long has performed in Australia, Japan, Hong Kong, Thailand, Brunei, Singapore, United Kingdom and USA as well as in many towns in the country. For the Saturday dinner show, HT Long will be performing in front of at least 350 special guests.